Շնչափողի մեջ տեղադրված էնդոշնչափողային խողովակի պատկերում. ↑ International Liaison Committee on Resuscitation, American Heart Association, and European Resuscitation Council (2005). "2005 International Consensus on Cardiopulmonary Resuscitation and Emergency Cardiovascular Care Science With Treatment Recommendations (Section 1, Part 4: Advanced Life Support)". Resuscitation. 67: 213–47. doi:10.1016/j.resuscitation.2005.09.018. PMID 16324990. ↑ Kabrhel, C; Thomsen, TW; Setnik, GS; Walls, RM (2007). "Videos in clinical medicine: orotracheal intubation". The New England Journal of Medicine. 356 (17): e15. doi:10.1056/NEJMvcm063574. PMID 17460222. ↑ James, NR (1950). "Blind Intubation". Anaesthesia. 5 (3): 159–60. doi:10.1111/j.1365-2044.1950.tb12674.x. ↑ Brain, AIJ (1985). "Three cases of difficult intubation overcome by the laryngeal mask airway". Anaesthesia. 40 (4): 353–5. doi:10.1111/j.1365-2044.1985.tb10788.x. PMID 3890603. ↑ Maharaj, CH; Costello, JF; McDonnell, JG; Harte, BH; Laffey, JG (2007). "The Airtraq as a rescue airway device following failed direct laryngoscopy: a case series". Anaesthesia. 62 (6): 598–601. doi:10.1111/j.1365-2044.2007.05036.x. PMID 17506739. ↑ Agrò, F; Barzoi, G; Montecchia, F (2003). "Tracheal intubation using a Macintosh laryngoscope or a GlideScope in 15 patients with cervical spine immobilization" (PDF). British Journal of Anaesthesia. 90 (5): 705–6. doi:10.1093/bja/aeg560. PMID 12697606. ↑ "Tracheostomy tube". Dictionary of Cancer Terms. National Cancer Institute. ↑ Tobias, JD (2009). "Helium insufflation with sevoflurane general anesthesia and spontaneous ventilation during airway surgery" (PDF). Canadian Journal of Anesthesia. 56 (3): 243–6. doi:10.1007/s12630-008-9034-1. PMID 19247745. ↑ Chotigeat, U; Khorana, M; Kanjanapattanakul, W (2007). "Inhaled nitric oxide in newborns with severe hypoxic respiratory failure" (PDF). Journal of the Medical Association of Thailand. 90 (2): 266–71. PMID 17375630. ↑ Goto, T; Nakata, Y; Morita, S (2003). "Will xenon be a stranger or a friend? : the cost, benefit, and future of xenon anesthesia". Anesthesiology. 98 (1): 1–2. doi:10.1097/00000542-200301000-00002. PMID 12502969. ↑ Macewen, W (1880). "Clinical observations on the introduction of tracheal tubes by the mouth instead of performing tracheotomy or laryngotomy". British Medical Journal. 2 (1022): 163–5. doi:10.1136/bmj.2.1022.163. PMC 2241109Freely accessible. PMID 20749636. ↑ Wolfe, T (1998). "The Esophageal Detector Device: Summary of the current articles in the literature". Salt Lake City, Utah: Wolfe Tory Medical. ↑ Morris, IR (1994). "Fibreoptic intubation" (PDF). Canadian Journal of Anesthesia. 41 (10): 996–1007; discussion 1007–8. doi:10.1007/BF03010944. PMID 8001220. ↑ Foley, LJ; Ochroch, EA (2000). 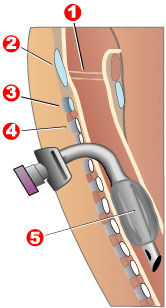 "Bridges to establish an emergency airway and alternate intubating techniques". Critical Care Clinics. 16 (3): 429–44, vi. doi:10.1016/S0749-0704(05)70121-4. PMID 10941582. ↑ Mohan, R; Iyer, R; Thaller, S (2009). "Airway management in patients with facial trauma". Journal of Craniofacial Surgery. 20 (1): 21–3. doi:10.1097/SCS.0b013e318190327a. PMID 19164982. ↑ Katos, MG; Goldenberg, D (2007). "Emergency cricothyrotomy". Operative Techniques in Otolaryngology. 18 (2): 110–4. doi:10.1016/j.otot.2007.05.002. ↑ Benkhadra, M; Lenfant, F; Nemetz, W; Anderhuber, F; Feigl, G; Fasel, J (2008). "A comparison of two emergency cricothyroidotomy kits in human cadavers" (PDF). Anesthesia & Analgesia. 106 (1): 182–5. doi:10.1213/01.ane.0000296457.55791.34. PMID 18165576. ↑ Heffner, JE (1989). "Medical indications for tracheotomy" (PDF). Chest. 96 (1): 186–90. doi:10.1378/chest.96.1.186. PMID 2661159. ↑ Lee, W; Koltai, P; Harrison, AM; Appachi, E; Bourdakos, D; Davis, S; Weise, K; McHugh, M; Connor, J (2002). "Indications for tracheotomy in the pediatric intensive care unit population: a pilot study". Archives of Otolaryngology—Head & Neck Surgery. 128 (11): 1249–52. doi:10.1001/archotol.128.11.1249. PMID 12431164. ↑ Borland, LM; Casselbrant, M (1990). "The Bullard laryngoscope. A new indirect oral laryngoscope (pediatric version)". Anesthesia & Analgesia. 70 (1): 105–8. doi:10.1213/00000539-199001000-00019. PMID 2297088. ↑ Theroux, MC; Kettrick, RG; Khine, H (1995). "Laryngeal mask airway and fiberoptic endoscopy in an infant with Schwartz-Jampel syndrome". Anesthesiology. 82 (2): 605. doi:10.1097/00000542-199502000-00044. PMID 7856930. ↑ Kim, JE; Chang, CH; Nam, YT (2008). ↑ "Intubation through a Laryngeal Mask Airway by Fiberoptic Bronchoscope in an Infant with a Mass at the Base of the Tongue" (PDF). Korean Journal of Anesthesiology. 54 (3): S43–6. doi:10.4097/kjae.2008.54.3.S43. ↑ Hackell, R; Held, LD; Stricker, PA; Fiadjoe, JE (2009). "Management of the difficult infant airway with the Storz Video Laryngoscope: a case series". Anesthesia & Analgesia. 109 (3): 763–6. doi:10.1213/ANE.0b013e3181ad8a05. PMID 19690244. ↑ Pahor, AL (1992). "Ear, nose and throat in ancient Egypt: Part I". Journal of Laryngology & Otology. 106 (8): 677–87. doi:10.1017/S0022215100120560. PMID 1402355. ↑ Frost, EA (1976). "Tracing the tracheostomy". Annals of Otology, Rhinology, and Laryngology. 85 (5 Pt.1): 618–24. PMID 791052. ↑ Stock, CR (1987). "What is past is prologue: a short history of the development of tracheostomy". Ear, Nose, & Throat Journal. 66 (4): 166–9. PMID 3556136. ↑ Yapijakis, C (2009). "Hippocrates of Kos, the father of clinical medicine, and Asclepiades of Bithynia, the father of molecular medicine. Review" (PDF). In Vivo. 23 (4): 507–14. PMID 19567383. ↑ Radomski, T (2005). "Manuel García (1805–1906):A bicentenary reflection" (PDF). Australian Voice. 11: 25–41. ↑ Sperati, G; Felisati, D (2007). "Bouchut, O'Dwyer and laryngeal intubation in patients with croup". Acta Otorhinolaryngolica Italica. 27 (6): 320–3. PMC 2640059Freely accessible. PMID 18320839.